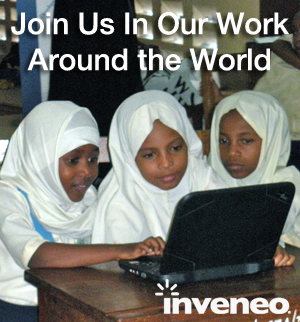 Inveneo delivers the tools of technology – sustainable computing and broadband – to those who need it most in the developing world, transforming lives through better education, healthcare, economic opportunities and faster emergency relief. Inveneo is a 501c3 nonprofit social enterprise. It is our mission to deliver the tools of Information and Communications Technologies (ICTs) — sustainable computing and better access to the Internet — to those who need it most, people and organizations in rural and highly underserved communities of the developing world. To achieve our mission, we use a three part approach. (1) We serve organizations that work in these underserved communities. We help these organizations use technology to accelerate their impact – by delivering improved education, better healthcare, access to economic opportunity and faster relief. These organizations understand the needs of the local community and have the ability to make the technology relevant, available and affordable for both the community and individuals needs. (2) We design and deliver smart technology solutions that are specifically designed to meet the needs of the organization and community. We bring together hardware, software and power to create systems that are affordable and sustainable in some of the most challenging environments in the developing world. (3) We work with local ICT entrepreneurs to ensure the ICT solutions are sustainable and that ICT projects build local jobs. We have built a network of in-country entrepreneurs that we recruit, train, certify and enter into long-term partnerships with to provide local project design, leadership, installation and ongoing support. Inveneo and our partners work together to deliver ICT solutions, that range from 100’s of solar-powered computing labs in rural communities to regional broadband networks. Since 2004, Inveneo and our Certified ICT Partners have delivered solutions to over 1,900 communities in Haiti, South Asia, sub-Saharan Africa, and around the world. There are now 128 Inveneo ICT partners. Inveneo and our partners have brought access to life-changing ICTs to 31 countries, reaching over 3,250,000 people in rural and underserved areas of the developing world.